Older individuals today are participating in athletic activities in greater and greater numbers, whether it is weekend sports enthusiasts or highly competitive senior athletes. Degeneration of the lumbar disc, associated degenerative facet arthritis, and spinal stenosis are the most common causes of low back and leg pain in the aging population, and the mature athlete is not immune from these processes. Degenerative lumbar disc disease in the mature athlete. Degenerative changes of the lumbar spine, including decreased signal intensity and disc bulging at the L-3/4, L-4/5 and L-5/S-1 discs. Degenerative lumbar disc disease in the mature athlete. 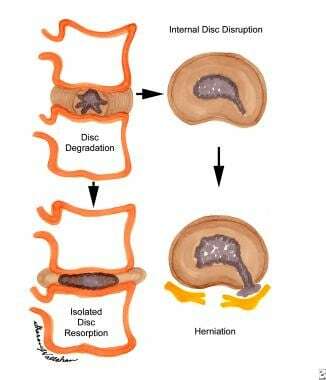 The process of disc degeneration following internal disc disruption and herniation. Degenerative lumbar disc disease in the mature athlete. The various forces placed upon the discs of the lumbarspine that can result in degenerative changes. Many mature athletes (typically aged 30 years or older) present with complaints of low back pain (LBP), radicular symptoms, neurogenic claudication, or a combination of all of these symptoms. These clinical syndromes in the mature athlete should be fully evaluated, accurately diagnosed, and appropriately treated to allow for return to athletic participation. Low back pain has an incidence of 5% per year and a prevalence of 60-90% in the general population. Epidemiological studies have found that the frequency of LBP increases as age increases to 60 years; in those older than 60 years, the frequency declines with increasing age. Certain groups of athletes, including weightlifters and soccer players, appear to have a higher incidence of disc space narrowing and spondylolisthesis, but this does not correlate to a greater incidence of back pain compared with the general population. The spine is composed of a series of spinal functional units, wherein each unit consists of 3 joints with an anterior and posterior segment. The anterior segment consists of 2 adjacent vertebral bodies and the intervertebral disc between them. The posterior segment consists of the laminae and their processes. One joint is formed between the 2 vertebral bodies, while the other 2 joints are formed by the articulation of the superior articular processes of 1 vertebra with the inferior articular processes of the vertebra above. The intervertebral disc consists of an inner core of gelatinous material called the nucleus pulposus. The nucleus pulposus is enclosed by a ring called the annulus fibrosus. The individual lumbar nerve roots exit laterally through the intervertebral foramen located on each side of the spinal functional unit. Each intervertebral foramen is bound anteriorly by the vertebral column and intervertebral disc. The intervertebral foramen is bound superiorly and inferiorly by a pedicle, while posteriorly it is bound by the vertebral lamina and zygapophyseal joint. The outer one third of the intervertebral disc is an innervated structure, while the remainder of the disc, including the nucleus pulposus, lacks any innervation. 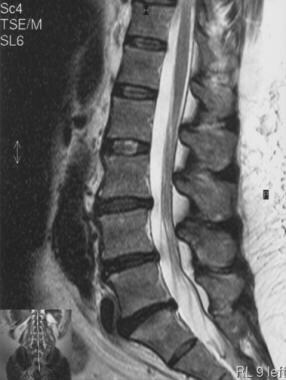 The sinuvertebral nerves are recurrent branches of the ventral rami that reenter the intervertebral foramina to be distributed within the vertebral canal. These nerves are mixed nerves, formed by a somatic root from a ventral ramus and an autonomic root from a gray ramus communicans. The sinuvertebral nerve supplies the posterior margin of the annulus fibrosus, anterior dura mater, dural sleeve, posterior vertebral periosteum, and the posterior longitudinal ligament. The anterior longitudinal ligament and the lateral aspect of the annulus fibrosus are both innervated by ventral rami and gray ramus communicans. The posterior rami of the spinal nerves supply zygapophyseal joints above and below the nerve, as well as the paraspinous muscles at multiple levels. The spinal motions that frequently are encountered in many sports and other activities include flexion and extension, torsion (rotational forces), and lateral bending. Additionally, certain sports can subject the spine to shear forces in the anterior and posterior position, as well as to compressive forces in the craniocaudal direction. Protection of the functional units of the spine requires unrestricted and efficient motions between adjacent vertebral segments. Simple flexion/extension movements and even moderate axial compression forces are relatively well tolerated by the disc and the associated joint complexes of the spine. Rotational forces and combined motions, such as forward flexion with rotation, have been shown to be the most injurious to the disc. Therefore, it is crucial that the supporting stabilizers of the spine, both static and dynamic, are sufficiently strong to offset some of these potentially injurious forces. The static stabilizers of the lumbar spine include the longitudinal ligaments, the intervertebral discs between the vertebral bodies, and the zygapophyseal joint capsules connecting the posterior elements of the spine. The dynamic stabilizers are comprised not only of the musculature surrounding the lumbar spine, but also include the abdominal and hip muscles, including the hip flexors, extensors, and abductors. The relationship of the pelvis to the spine is an important consideration when assessing problems in the lumbar spine. Increased lumbar lordosis may result from anterior pelvic tilt, resulting from weak abdominals and/or tight hip flexors. Decreased lumbar lordosis may result from posterior pelvic tilt, resulting from weak paraspinal extensor muscles and/or tight hamstring muscles. The dynamic stabilizers of the spine, when acting synergistically, can directly or indirectly reduce the shear forces to the intervertebral disc and to the zygapophyseal joints of the spine. Of note, athletes overall do not necessarily seem to have stronger back muscles when compared to nonathletes, at least in studies of certain collegiate level athletes. Sports injuries often involve a twisting or torsion movement, whereas falls are rarely a precipitating cause. The most common area of complaint among male golfers of the Professional Golfer's Association is the lower back, with an estimated 10-33% of touring professionals reportedly playing with back complaints of some degree. Amateur golfers also identified LBP as their most common golf-related injury. The golf swing frequently has been implicated as a major source of injury to the spine in both professional and amateur golfers. Discogenic LBP most likely develops because of the axial rotation of the lumbar spine at the top of the backswing, with the subsequent uncoiling and hyperextension through the downswing and follow-through. Several forces act on the lumbar spine during the golf swing. 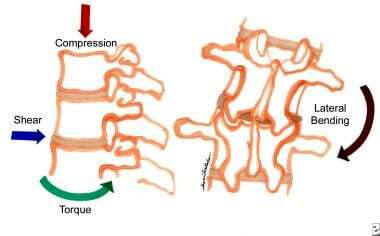 Rotational forces are developed as a result of twisting of the vertebral segments about the spine. Additionally, the spine is subjected to shear forces in the anteroposterior direction, axial compressive forces, and lateral bending forces. Hosea and Gatt analyzed the various forces on the spine in the swings of amateur and professional golfers. They determined that these forces were actually greater in amateur players compared to professional players. The amateur golfers generated greater lateral bending, anteroposterior shear, and rotational forces, with equal axial compression noted in the 2 groups. They determined that the loads required to cause disc disruption in cadaveric studies were similar to the loads that occur in the golf swing. The importance of trying to minimize forces on the spine through proper swing mechanics becomes clear. Additionally, strengthening the dynamic stabilizers of the spine to counteract the significant forces exerted on the spine during the golf swing is important in both the prevention and treatment of golf-related low back injuries. Hosea TM, Gatt CJ Jr. Back pain in golf. Clin Sports Med. 1996 Jan. 15(1):37-53. [Medline]. Videman T, Sarna S, Battié MC, Koskinen S, Gill K, Paananen H, et al. The long-term effects of physical loading and exercise lifestyles on back-related symptoms, disability, and spinal pathology among men. Spine. 1995 Mar 15. 20(6):699-709. [Medline]. Carragee EJ, Tanner CM, Khurana S, Hayward C, Welsh J, Date E, et al. The rates of false-positive lumbar discography in select patients without low back symptoms. Spine. 2000 Jun 1. 25(11):1373-80; discussion 1381. [Medline]. Khot A, Bowditch M, Powell J, Sharp D. The use of intradiscal steroid therapy for lumbar spinal discogenic pain: a randomized controlled trial. Spine. 2004 Apr 15. 29(8):833-6; discussion 837. [Medline]. Buttermann GR. The effect of spinal steroid injections for degenerative disc disease. Spine J. 2004 Sep-Oct. 4(5):495-505. [Medline]. Gibson JN, Waddell G. Surgery for degenerative lumbar spondylosis: updated Cochrane Review. Spine. 2005 Oct 15. 30(20):2312-20. [Medline]. Fritzell P, Hägg O, Wessberg P, Nordwall A,. 2001 Volvo Award Winner in Clinical Studies: Lumbar fusion versus nonsurgical treatment for chronic low back pain: a multicenter randomized controlled trial from the Swedish Lumbar Spine Study Group. Spine. 2001 Dec 1. 26(23):2521-32; discussion 2532-4. [Medline]. Brox JI, Sørensen R, Friis A, Nygaard Ø, Indahl A, Keller A, et al. Randomized clinical trial of lumbar instrumented fusion and cognitive intervention and exercises in patients with chronic low back pain and disc degeneration. Spine. 2003 Sep 1. 28(17):1913-21. Keller A, Brox JI, Gunderson R, Holm I, Friis A, Reikerås O. Trunk muscle strength, cross-sectional area, and density in patients with chronic low back pain randomized to lumbar fusion or cognitive intervention and exercises. Spine. 2004 Jan 1. 29(1):3-8. [Medline]. Suratwala SJ, Pinto MR, Gilbert TJ, Winter RB, Wroblewski JM. Functional and radiological outcomes of 360 degrees fusion of three or more motion levels in the lumbar spine for degenerative disc disease. Spine (Phila Pa 1976). 2009 May 1. 34(10):E351-8. [Medline]. Arnold PM, Robbins S, Paullus W, Faust S, Holt R, McGuire R. Clinical outcomes of lumbar degenerative disc disease treated with posterior lumbar interbody fusion allograft spacer: a prospective, multicenter trial with 2-year follow-up. Am J Orthop (Belle Mead NJ). 2009 Jul. 38(7):E115-22. [Medline]. Barendse GA, van Den Berg SG, Kessels AH, Weber WE, van Kleef M. Randomized controlled trial of percutaneous intradiscal radiofrequency thermocoagulation for chronic discogenic back pain: lack of effect from a 90-second 70 C lesion. Spine. 2001 Feb 1. 26(3):287-92. [Medline]. Pauza KJ, Howell S, Dreyfuss P, Peloza JH, Dawson K, Bogduk N. A randomized, placebo-controlled trial of intradiscal electrothermal therapy for the treatment of discogenic low back pain. Spine J. 2004 Jan-Feb. 4(1):27-35. [Medline]. Park SY, Moon SH, Park MS, Kim HS, Choi YJ, Lee HM. Intradiscal electrothermal treatment for chronic lower back pain patients with internal disc disruption. Yonsei Med J. 2005 Aug 31. 46(4):539-45. [Medline]. Jabłońska R, Ślusarz R, Królikowska A, Haor B, Antczak A, Szewczyk M. Depression, social factors, and pain perception before and after surgery for lumbar and cervical degenerative vertebral disc disease. J Pain Res. 2017 Jan 4. 10:89-99. [Medline]. The authors and editors of Medscape Reference gratefully acknowledge the contributions of previous coauthor Stephen G Andrus, MD, to the development and writing of this article.